#AcAdv Chat | A place for advisors to chat with one another. A place for advisors to chat with one another. We look forward to chatting with you every other week on Tuesdays from 12-1 pm CDT with academic advisors, academic counselors, and those who support students in higher education. The chat TOPICS will vary each TUESDAY we meet to tweet. We welcome faculty, professionals, and other colleagues at your higher education institution or organization to contribute to the conversation. These digital water cooler dialogues on Twitter are open for all to respond OR follow along the stream. Want to learn what we’ve talked about? Check out the #acadv transcript archives from our past chats. 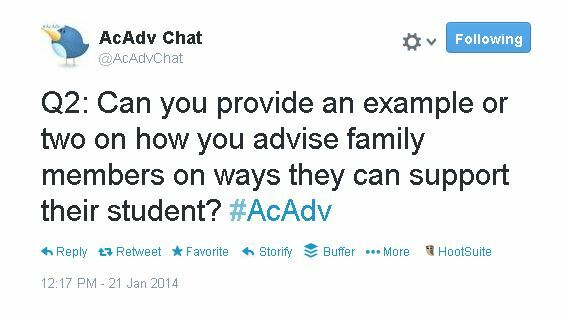 The @AcAdvChat is a great way to share ideas, swap resources, learn new things, and talk about issues in #highered for supporting learners with a professional advising network on Twitter. Be sure to add the Academic Advising (#acadv) Chat SPRING 2019 SCHEDULE to your calendar now, so you don’t miss this opportunity to chat with other advisors for professional development, learning, and more! Here’s a quick “HOW TO” participate in a Twitter Chat and a Twitter Chat 101 resource for you to brush up on your tweeting skills to help you JOIN our #acadv discussions. Tweet y’all soon! 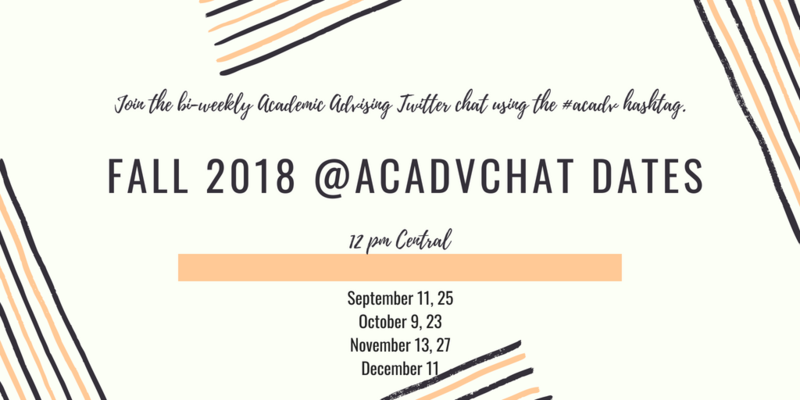 Save the dates for the Fall 2018 #AcAdv Chats and tell your academic advising colleagues to join in the conversation! Put these dates on your calendar to chat bi-weekly on Tuesdays from 12-1 pm CDT with academic advisors, academic counselors, and those who support students in higher education. The chat TOPICS will vary each TUESDAY we meet to tweet. We welcome faculty, professionals, and other colleagues at your higher education institution or organization to contribute to the conversation. These digital water cooler dialogues on Twitter are open for all to respond OR follow along the stream. Be sure to add the Academic Advising (#acadv) Chat FALL 2018 SCHEDULE to your calendar now, so you don’t miss this opportunity to chat with other advisors for professional development, learning, and more! Here’s a quick “HOW TO” participate in a Twitter Chat and a Twitter Chat 101 resource for you to brush up on your tweeting skills to help you JOIN our #acadv discussions. Tweet y’all soon! Save the dates on your calendars! Share with your academic advising friends! Join us for our bi-weekly conversations on Tuesdays from 12-1 pm CDT with academic advisors, academic counselors, and those who support students in higher education. The chat TOPICS will vary each TUESDAY we meet to tweet. We welcome faculty, professionals, and other colleagues at your higher education institution or organization to contribute to the conversation. These digital water cooler dialogues on Twitter are open for all to respond OR follow along the stream. Want to learn what we’ve talked about? 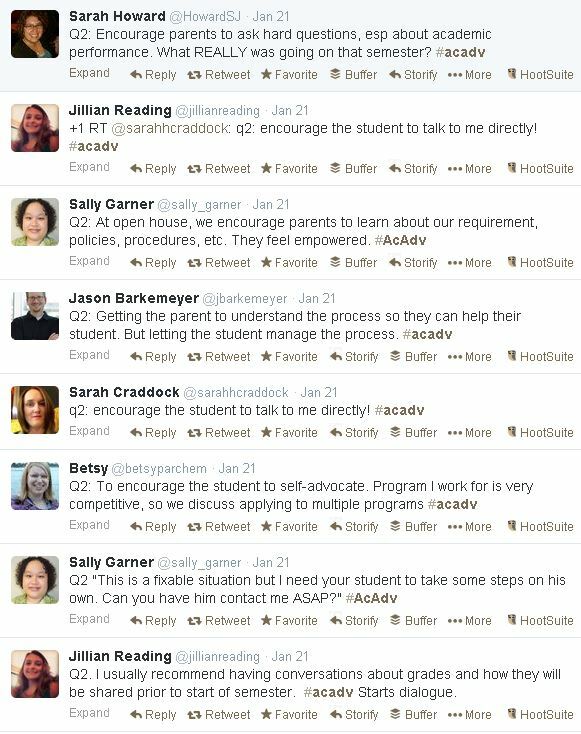 Check out the #acadv transcript archives from our past chats. The @AcAdvChat is a great way to share ideas, swap resources, and talk about relevant issues in #highered for supporting learners among a clever network of professionals on Twitter. 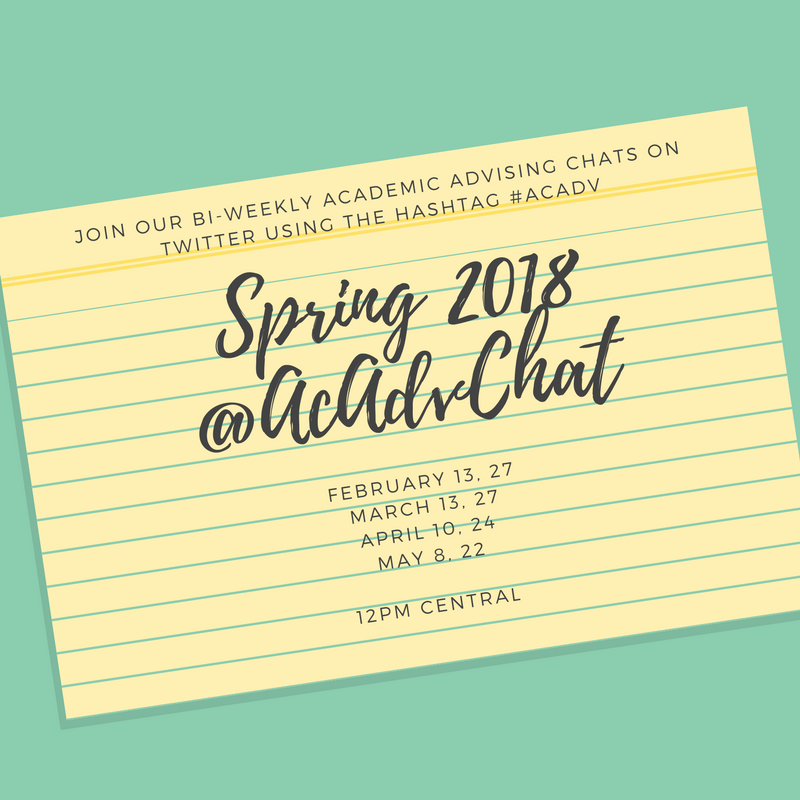 Be sure to add the Academic Advising (#acadv) Chat SPRING 2018 SCHEDULE to your calendar now, so you don’t miss this opportunity to chat with other advisors for professional development, learning, and more! Here’s a quick “HOW TO” participate in a Twitter Chat and a Twitter Chat 101 resource for you to brush up on your tweeting skills to help you JOIN our #acadv discussions. Tweet y’all soon! Mark your calendars! Tell your academic advising friends! The #AcAdv Chat is back on Twitter for semi-regular conversations on Tuesdays from 12-1 pm CDT with academic advisors, academic counselors, and those who support students in higher education. The chat topics will vary each TUESDAY we meet to tweet. Want to learn what we’ve talked about? Check out the #acadv transcript archives from our past chats). Also, ALL are welcome to join, regardless of your role at your institution or in your organization. The @AcAdvChat is a great way to share ideas, swap resources, and talk about relevant issues in #highered for supporting learners among a clever network of professionals on Twitter. 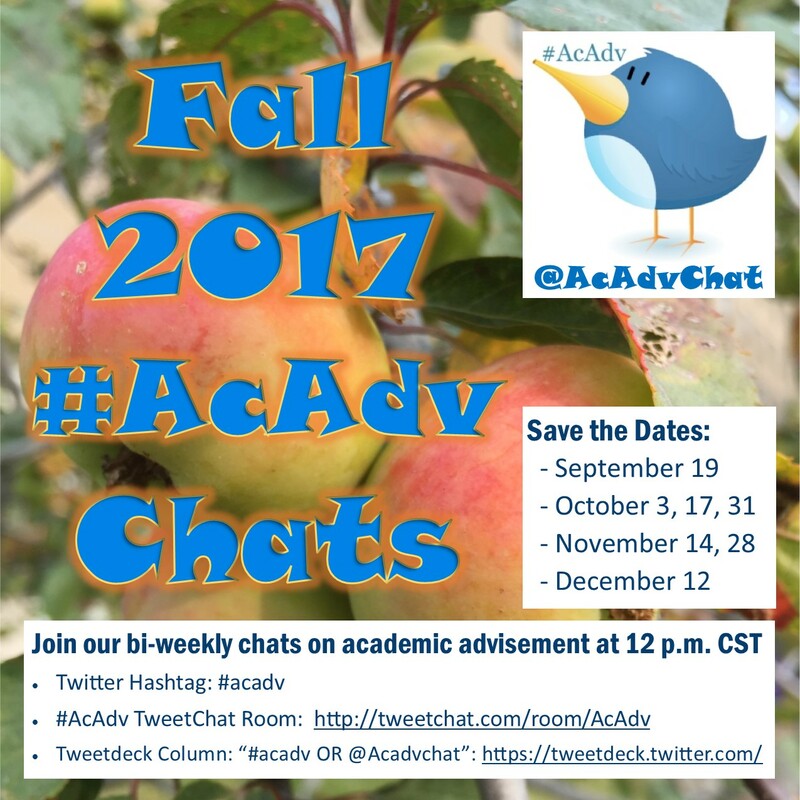 Be sure to add the Academic Advising (#acadv) Chat FALL 2017 SCHEDULE to your calendar now, so you don’t miss this opportunity to chat with other advisors for professional development, learning, and more! 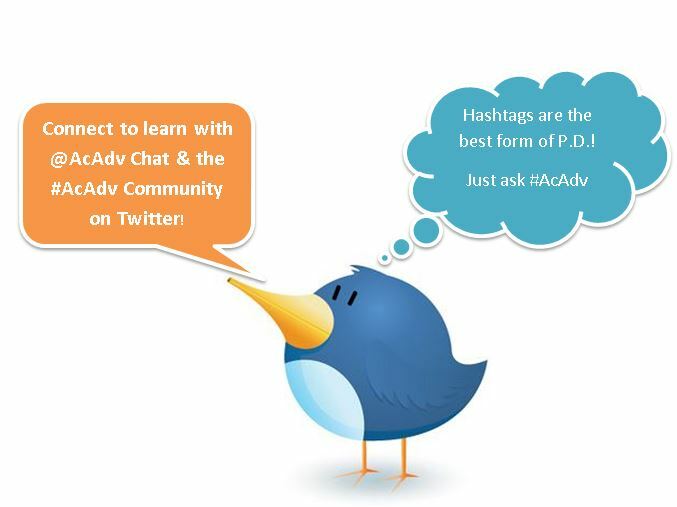 Here’s a quick “HOW TO” participate in a Twitter Chat and a Twitter Chat 101 resource for you to brush up on your tweeting skills to help you JOIN our #acadv discussions. Tweet y’all soon! As much as we would LOVE to chat every TUESDAY from 12-1 pm CST, we have decided to move to a bi-weekly schedule. To keep you organized and updated, here’s a schedule of all the chats we have planned from January to May 2016. Won’t you join us for a chat? Or are you just getting started? Here’s a quick “HOW TO” participate in a Twitter Chat and a Twitter Chat 101 resource for you to check out. To mix things up a bit on the #acadv chat discussion thread, our next LIVE chat on Tuesday, November 19, 2014 from 12-1 pm CT will involve an academic advising “common reading.” The purpose of a common reading is engage faculty and practitioners in academic advising in a dialogue about literature and research. This method of professional development encourages scholarly engagement, reflection, problem-solving, and communication among academic advising peers (Schulenberg, Larson & Bermudez, 2010). Since some of our #AcAdv Community members might not be part of the NACADA association (for journal access) the author, Keith L. Powers (a.k.a. @KeithPowers_USI) has graciously shared the pre-print version for the purpose of next Tuesday’s (11/19) #AcAdv Chat. This pre-print manuscript is openly being shared HERE, with the caveat that this manuscript is quite different from the final product, the NACADA Journal publication, however the research findings are the same. Thank you for your support and we hope you can join the conversation, Keith! We hope that you have a chance to READ this article (in either format) in advance of our conversation on Tuesday. We are excited to hear your thoughts, discussions, and ideas about how this scholarly piece can be applied to your academic advising practice. If you have questions for the author, or about this piece, please tweet at @acadvchat in advance of our chat on Tuesday. Tweet you soon! Do you make New Year resolutions? Or is it just time to set some goals for the academic semester? 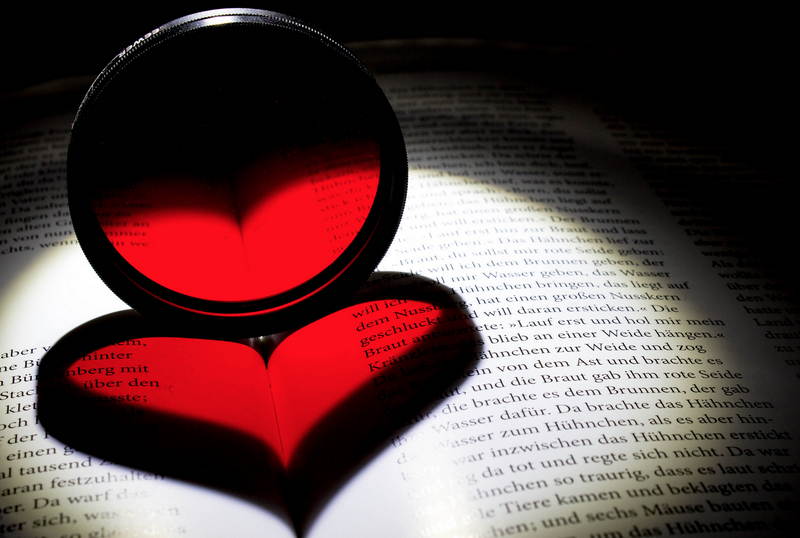 Academic advisors often support their student and the success of others; however to do this well it is important to take time to “sharpen the tool” to learn as well. Read the #AcAdv Chat Archives: There is a wealth of great ideas, messages, websites, and resources shared on the #AcAdv Chat Blog from past @AcAdvChat sessions for you to READ in the #AcAdv Chat ARCHIVES. Sign Up For Twitter & Follow the #AcAdv Community: Get connected with academic advisors who are on Twitter. . Follow @AcAdvChat on Twitter or “like” our #AcAdv Chat Facebook Page. Also connect to a growing group of advisors who participate in @AcAdvChat and often tweet using the #AcAdv hashtag. Here’s a list of advisors on Twitter curated by one of our #AcAdv Chat Moderators.